We offer many options to help sell, lease or rehome your horse or pony. We accept horses on consignment, occasional trades, and private treaties. When consigning your horse with SME you will receive the best quality care, fitness program, and advertising to assure your horse is looking it's best at all times through out the sale process! We want to help you reach your sales goals in a reasonable amount of time to maximize your experience! Please contact us for more information on our program! "Prada" - 15h, 2009 APHA Filly with phenomenal lines! 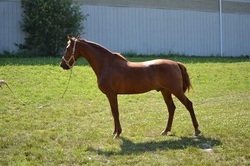 Boasting Bonanza Dot Com as her sire, Prada is a beautiful mover with hunter type flat knees. Quiet, steady, easy mare! She is currently confidently doing courses up to 2'6" with lead changes and has been winning all over southern New England with young riders since 2014. She has ended every season with year end awards in hunter divisions at RIHA, SEHA, CCHS, and many schooling series. "Snickers" - 13h - 1999 Welsh Cross - a lovely athletic pony who excels in all three rings! Has the speed, and accuracy for the jumper ring and would love a pony jumper kid to win with! He is right at home in the hunter and equitation rings as well as he is consistent, easy to ride, and handy with quality and adjustable gaits. Bold and reliable over fences he makes the perfect short stirrup to children's hunter pony! 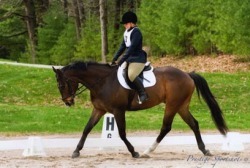 Snickers has also done well as a dressage pony. Available for on farm partial or half lease! "Chance" is a '98, 16.3 hand Holsteiner X Gelding.